Darragh Fitzgibbon lost his appeal against a red card in the semi-final. Fitzgibbon has been hugely impressive for the Cork senior side this year. CORK WILL HAVE to plan without Darragh Fitzgibbon for Wednesday night’s Bord Gáis Energy Munster U21 hurling final against Limerick after he lost his appeal against the dismissal in the semi-final win over Waterford. 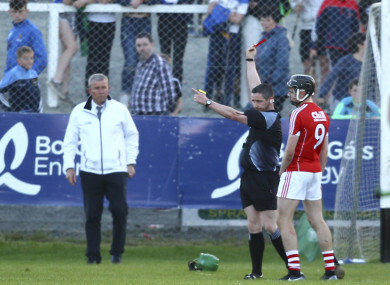 The Charleville player’s case was made yesterday evening as he sought to overturn the one-match ban but the suspension still stands and Cork will have to plan without him for the match at the Gaelic Grounds. Fitzgibbon was dismissed in injury-time of the recent semi-final win over Waterford after striking goalkeeper Billy Nolan on the arm. Despite that setback Cork managed to dig out a victory when Declan Dalton smashed home a late penalty. The 20-year-old will be a major loss as he was in sparkling form in that game in Walsh Park as he chipped in with 0-3 from play at midfield. Fitzgibbon has made a major breakthrough this season at senior level since making his championship debut against Tipperary in May and was part of the Munster senior final win over Clare earlier this month. His one-match suspension will only cover games in that grade so he is available for Cork’s All-Ireland senior semi-final on 13 August. Cork are hopeful that senior forward Luke Meade will be available after missing the success over Waterford through injury. Email “Cork senior midfielder to miss Munster U21 final through suspension”. Feedback on “Cork senior midfielder to miss Munster U21 final through suspension”.